I have a quick post for you tonight. I made a card for not 1.... not 2.... but.... 3 challenges! A sketch, a theme and a color! I haven't bought one of the Simon Says Stamp card kits for a while, but I totally fell in love with the one containing the Sketched Flowers set. You can buy this as a stand-alone stamp set. I loved the idea of being able to color this and take segments of the large image. 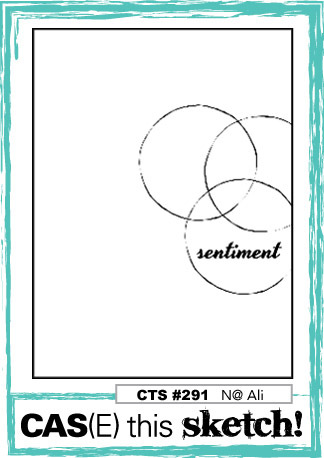 When I saw the color challenge across at JAI - I knew they would be perfect for this new stamp set and, then, when I saw the sketch with the three circles across at CaseThisSketch - I knew that the segment of the stamp with the three circles was perfect for the sketch. 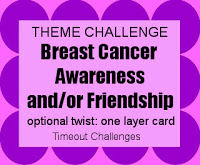 Then... how could I resist the Theme challenge at Time Out. Friendship and Breast Cancer Awareness. I began by stamping the segment that had the three circles in the approximate position they are in the sketch and then I went to town with my Copic marker equivalents of the SU colors. I absolutely LOVE these colors together. 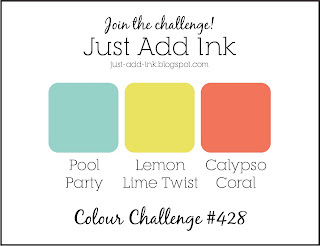 The coloring was really simple for me - just a couple of shades of each color. To finish the card, I added a sentiment and some sequins.